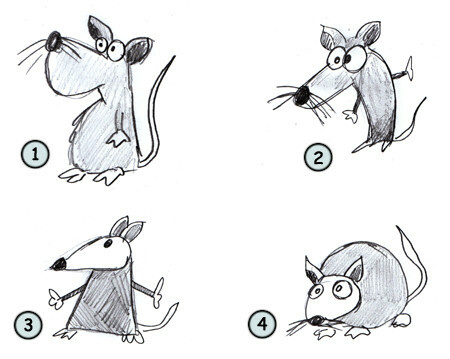 Drawing cartoon rats: some fun facts before starting sketching! 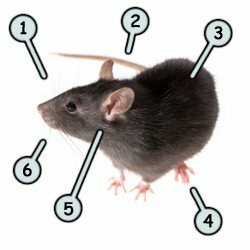 A rat can survive a long period of time without drinking water. Rats are very good swimmers. This is one of the animals that can be found on the Chinese Zodiac. 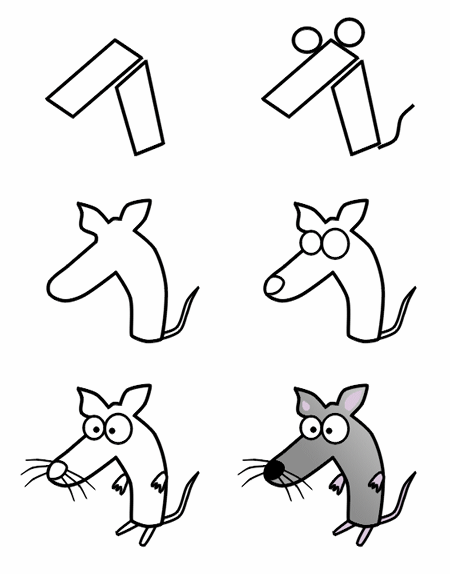 This tutorial will help you learn how to draw cool lovable rats. This feared animal was born with a small pointed snout (1), some round hairless ears (5) and a long pink tail (2). Don't forget the whiskers (6), the clawed feet (4) and the big body (3). They can be black, beige or brown. This is not a very popular animal in big cities like New York! The shapes of this animal can be resumed very easily. A big circle for the body, two small circles for the ears and a long line for the tail. The head is made of an oval shape with one of the edges being more pointed. The feet can be drawn using a circle with four small lines for the toes. Overall, it's not such a difficult animal to draw. Then, add three circles to form the eyes and the nose. Finally, add details like the whiskers and the feet. There you have it! A cool original rat! 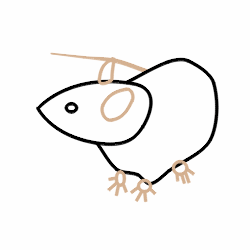 If you found this example a little too difficult, you might want to try sketching a more simple rat (3). Or, if you want to go for something more elaborate, why not try to draw a rat standing with more curves and details (1). This one can also be easy to draw despite the fact that a little perspective is present (4). Have fun!